In today’s digital world, it has become tricky to effectively market your restaurant to stay ahead of your competition. The key to restaurant marketing success in 2019 lies in knowing exactly who your customers are and how they behave at your physical location. Then you can develop, deliver and continuously improve targeted marketing campaigns aimed at specific segments of your audience. Many marketers use the analytics data from their company website. They can also send out surveys to their customer subscriber list, or use social media to gather more data. There are also third-party companies that can gather the data for you. And, of course, there’s always face-to-face conversation. An emerging strategy for restaurants, and one of our 2019 restaurant marketing ideas is to collect consistent and dependable data about their customer demographics and behavior uses their existing WiFi access points. Using commercial-grade access points like Cisco Meraki, restaurant marketers can not only passively gather valuable customer data, presence analytics, but they can measure the effectiveness of their marketing campaigns, all the way down to a customer walking back through the door. WiFi analytics are so powerful for restaurants because they allow marketers to see data on their actual visiting customers like they’ve never seen before, and from a very large sample size. It’s not just the type of statistical data that you get from internet analytics platforms. They will see physical behavior data as well, which is a catalyst for comprehensive, measurable, and successful restaurant marketing in 2019 and beyond. Reaching customers directly is vital for successful brick-and-mortar marketers. Thus making this marketing idea of capturing customer contacts data extremely vital to your 2019 restaurant marketing strategy. There are various ways in which to collect customer contact information, from trade shows to apps to directly asking for it face-to-face. These approaches are ultimately effective, but may take time to generate a significant subscriber list. Another great way to collect contact information more quickly is to make use of your physical location’s WiFi. Customers are presented with a captive portal page when they attempt to log into your guest WiFi. This is a web page that forces a user to enter information before access to the internet is granted. Typically, an email address is required. However you decide to gather this information, it is recommended that every email address is validated prior to being used, ensuring users do not provide a bogus address. Many marketers are unaware that attempting to send an email to an invalid address can do harm to your email campaigns on a universal level. If your emails are being sent to nonexistent or “fake” accounts, your Sender Reputation Score will be negatively affected. When your score becomes too low, the ESP may elect not to deliver the email to their user inboxes. This can become very expensive to your marketing and begin skewing your ROI as messages never arrive in your prospects’ inboxes, and less revenue is generated. As mentioned above, knowing who your customer are and how they behave is essential in creating the most effective marketing campaigns. High level customer profiles can be created by marketers by talking to their patrons and getting to know their likes and dislikes, their preferred contact channels (email, social media, direct mail, etc. ), and other personal preferences. Over time, you’ll be able to create various profiles or buyers personas of your ideal customers based on the information you gather. You can then customize your messaging to your specific customer profiles so that you are more likely to engage with them and turn them into loyal patrons. Many restaurants are using their WiFi connection to build much more detailed customer profiles. 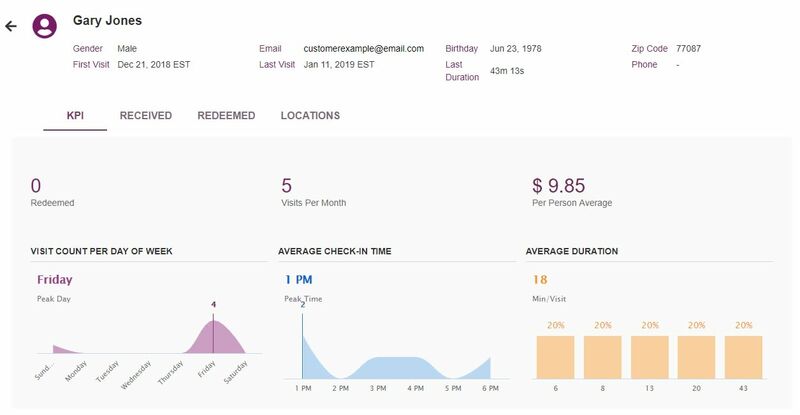 When a patron logs into WiFi, a customer profile is automatically built around that person’s device, including user demographics, and their past behavior at your locations. By implementing progressive profiling and other 2019 restaurant marketing ideas, restaurant marketers can configure their WiFi to ask the customer to enter one piece of missing profile information every time they return and log into WiFi. Over time, restaurateurs will have thousands of detailed customer profiles from which to research and then segment these patrons into groups of ideal customers. Using a Wifi marketing & analytics platform to collect a large volume of the right data, personalizing your marketing campaigns has never been easier. You’ll feel confident as you make data-driven decisions, drive company growth and build a much larger base of loyal customers. Once the customers are segmented into their various groupings or buyers personas, marketers can then develop marketing campaigns that will better appeal to each of those customer segments. This increases the likelihood of the customer engaging with the message and converting into more revenue for your business. For instance, you probably wouldn’t send the same message or offer to a woman who visits once a week on Tuesday at lunchtime that you would send a man who visits late at night on the weekends. Segmenting these customers and personalizing each message will increase the probability that the message will be effective. The point in segmentation is to help assure that the message you’re sending is relevant, useful and, most importantly, worth their time to read. This adds value to their experience and has been proven to quickly increase consumer engagement and ROI of the campaign. Today’s consumers love to engage with content, and they thrive on content that is targeted directly to them. Segmented content marketing through email is a great way to give consumers what they now expect. It aims valuable, informative and interesting content at your smaller, defined segments of customers. According to statistics published by CMO, targeted marketing is twice as effective as non-targeted mass marketing. Additionally, a study by Gartner has indicated that by 2021, all marketing content will rise to high-quality expectations of attention-limited audiences. By delivering this high-quality, interesting and engaging content, brands can help ensure a rise to the top, drowning out any lower-quality content from the competition. Another way to execute a successful content marketing initiative is to start a blog on your company website. Provide your readers with things like recipes, holiday food ideas, and new menu item descriptions and images. You can cover local events and food-related news stories in a fun and engaging way. Give them answers to common questions, interesting customer stories and entertaining commentary – whatever your ideal customer segments are interested in. Blogging is effective and engaging, but it is also a commitment. Whatever schedule you decide on – once a week, twice a month, every day, etc. – you need to publish on time, every time. It is also common practice to send marketing messages and promotions to your customer list through email. You want to be careful not to send overly-bold, aggressive sales messages. This will cause many subscribers to unsubscribe from your list, report the email as spam, or block your email address. Surveys – Surveys are a great way to get direct market research from your customers. Find out what they like and dislike. What do they think about your food, your service, your atmosphere? What questions do they have? The results can not only help you improve your customer experience, but can help you come up with some great story ideas for your content marketing. Offers – Offers are a great way to get customers back in the door. Common offers include discounts on food & drink, free items such as appetizers or desserts, and e-tickets for sponsored events. Ratings Requests – Good customer ratings are significant in 2019. Consumers often research online to find a place to dine, so you want to have the highest ratings possible. With triggered marketing you can ask patrons who had a good experience in your restaurant to leave a rating on the main online ratings websites. Event Promotions – Do you host or sponsor community events? Do you have live music or other entertainment? Let your customers know what is upcoming to help fill the seats. New Menu Items – These are great messages to send for getting customers to come back. Make sure to include a high-quality image of the item and think about offering a discount on the item for a limited time. These types of marketing messages will engage your customers and deter them from unsubscribing or reporting it as spam. Having access to both the customer data and their contact information – usually their email address – email marketing can be one of your primary ways of communicating with your customers. The Bloom Intelligence centralized Wifi marketing & customer intelligence hub allows restaurant marketers to easily collect detailed customer profiles, create and send content marketing messaging to customer segments, and measure the tangible ROI of each campaign. Wrapping up our 2019 restaurant marketing ideas, restaurant marketing in 2019 is far different from just a few years ago. Gain a competitive edge with these 2019 restaurant marketing ideas whether you do these items manually or use tools that will automate this process. Fortunately, marketers have growth tools like Bloom Intelligence to make it much easier to create and execute high-quality, measurable marketing campaigns.